Different situations require different services. Some furniture removal companies require you to leave the furniture outside at the curb or another easily accessible location. Other companies will come into the home and remove the furniture. Some companies will be willing to navigate stairs while others will not. Determine the circumstances around your furniture removal job and what services you will need to accomplish it. Then, seek out companies that meet your individual needs. The best furniture removal company will be willing and able to provide whatever services you require. If you have a large amount of furniture to dispose of, you may be looking at multiple trips by the furniture removal company. The company that has the largest equipment and trucks is going to be able to offer you the best value. The smaller the truck, the more trips that have to be made to complete the job. The more trips that are made, the higher the cost. The cost for your furniture removal should be a simple matter. It will be partly based on how much furniture you have to remove, where the furniture is located, what is required to access it, and how many trips it takes to get it all. Shop around for the most competitive prices. Be wary also of any company that cannot give you a definitive quote for their services. You don’t want to run into any hidden fees or charges. Junk removal doesn’t have to be dirty and performed by rude or discourteous workers. Check out the cleanliness of the trucks when you investigate the company. The cleaner their equipment and employees, the more likely it will be that they will be professional about the job. Professionalism means that your space is left in at least as good condition as it was when they arrived, if not better. You can also get an idea of the professionalism of the furniture removal company when you first contact them for a quote. Polite and helpful representatives that schedule your job with no hassle will be more likely to have polite and courteous employees to perform the job itself. In addition to wanting the most convenient and cost-effective method of furniture removal, it is also important to be responsible about it. Many furniture removal companies simply take your furniture to the dump or landfill. In fact, landfills in the US accumulate about 9 million tons of furniture each year. Instead of allowing your furniture to help clutter and pollute the planet, choose a furniture removal company that works with recycling sorting centers. While furniture in its entirety may not be recyclable, many of its parts and pieces can be recycled. A processing center can dismantle furniture and sort it into its recyclable parts before removing the true waste to the landfill. It is important to check out the reputation of the furniture removal company before making a decision. There are many review sites that offer people the chance to comment on a company of any type. Usually a Google search for the company will bring up reviews. You should also check their rating with the Better Business Bureau. You can usually judge the type of customer service you will receive by your first impressions of the furniture removal company. Whether their website is up to date and provides useful information is one sign that you are working with a reputable company that cares about their customers. They should have multiple ways to contact them, and every contact should be polite and professional. They should also be willing to work around your availability. Many people find that Junk King is the best furniture removal company for their needs. We pride ourselves on our professionalism, customer service, and reputation. 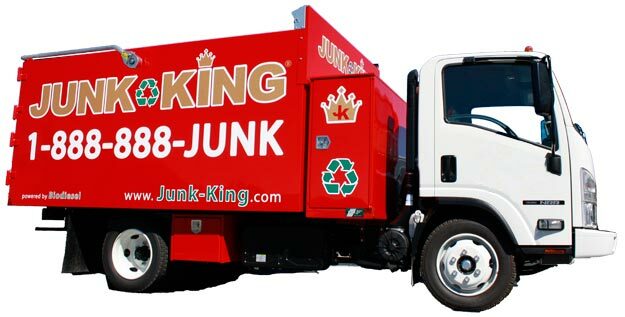 Junk King is also environmentally-conscious and will handle your furniture removal in the most sustainable way possible. We will work with your schedule and make the experience as stress-free and convenient as possible. Contact us today for more information or to schedule your furniture removal job.